Take Transit to the Ballpark! Riding your bike or the bus to the ballpark? Enjoy 15 percent off your in-person day-of-game purchase. Kick back and enjoy a Durham Bulls baseball game with family and friends. Choose to take transit there, and you won’t have to deal with traffic or pay for parking, gas, taxi or car service. So why wait? 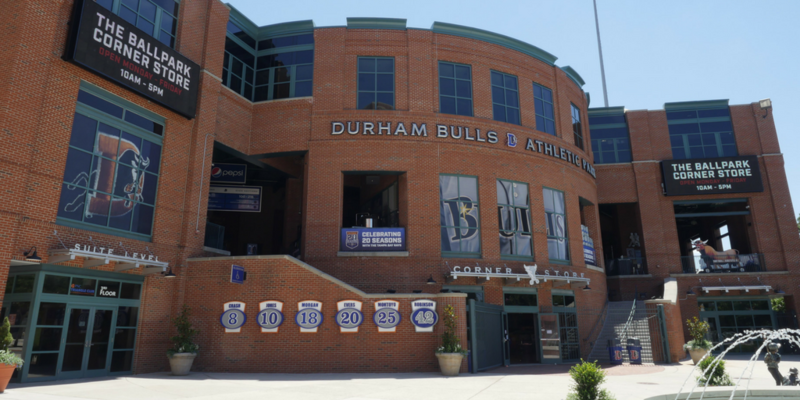 Head to the Durham Bulls Athletic Park to unwind and cheer on your home team. The Durham Bulls play April 5 through Sept. 3, with some nights featuring post-game fireworks! Mascot Wool E. Bull is always on hand to entertain, and promotions range from $1 concessions to “Star Wars” Night to “Diamond Cutters” performances from the grounds crew! View the full schedule. Pick a date to head out to the ballpark for a memorable outing. Morrisville/Cary: Park at the Park & Ride at Regional Transit Center on Slater Road. Take the 700 bus to get to the Durham Station. From Durham Station you walk through the American Tobacco Campus to get to Durham Bulls Athletic Park. Games normally end with time to catch the last bus at 10:05 p.m. Monday through Saturday. Chapel Hill/Carrboro: Take the 400 or 405 from Franklin Street in Chapel Hill. From Durham Station you walk through the American Tobacco Campus to get to Durham Bulls Athletic Park. Games normally end with time to catch the last bus at 10:05 p.m. Monday through Saturday. Raleigh: Take the 100 bus to the Regional Transit Center on Slater Road. Buses leave Raleigh about every 30 minutes on weekdays and hourly on Saturdays and Sunday. At the RTC, connect to the Route 700 bus to get to the Durham Station, which is a short walk away from the Durham Bulls Athletic Park. Make sure to leave the game in time to catch the last Route 700 bus, which leaves Durham Station at 10:05 p.m. Monday through Saturday. You can also take the Route DRX express bus home from an early afternoon game. Riding the bus is easy, and all Triangle bus systems are ADA-accessible. Choose from the three resources below to find the closest stop, and learn more here. GoTriangle Maps and Schedules — Locate maps, schedules and more. Our bus drivers accept cash if you have exact change, or you can buy a pass ahead of time online. GoTriangle buses are FREE for children under age 5, and seniors age 65 and older get a discount. Call 919-485-RIDE (7433), and a customer representative will be glad to assist you.